Oil on canvas: 31 x 25 3/8 in. 78.75 x 64.5 cm. This exquisite celebration of The Nativity belongs to the high point of the 16th.century Venetian School, and in particular to the ambient of the artist’s father, known as Paolo Veronese. It is now accepted that a part of the oeuvre of Veronese was executed by his son, either solely or in collaboration with his father. Carlo, or Carletto as he was known, was the most distinguished of Veronese’s two sons, training in his father’s studio and eventually taking over the practice. Under the influence of Jacopo Bassano, with whom Carlo also studied, he fashioned a series of works that reflect his father’s theatrical flair, passion for sumptuous materials and landscape detail. One such work is the Angelica and Medoro of 1584 in the Barbieri collection, Padua, recently sold at the Dorotheum in Vienna for 87500 euros. 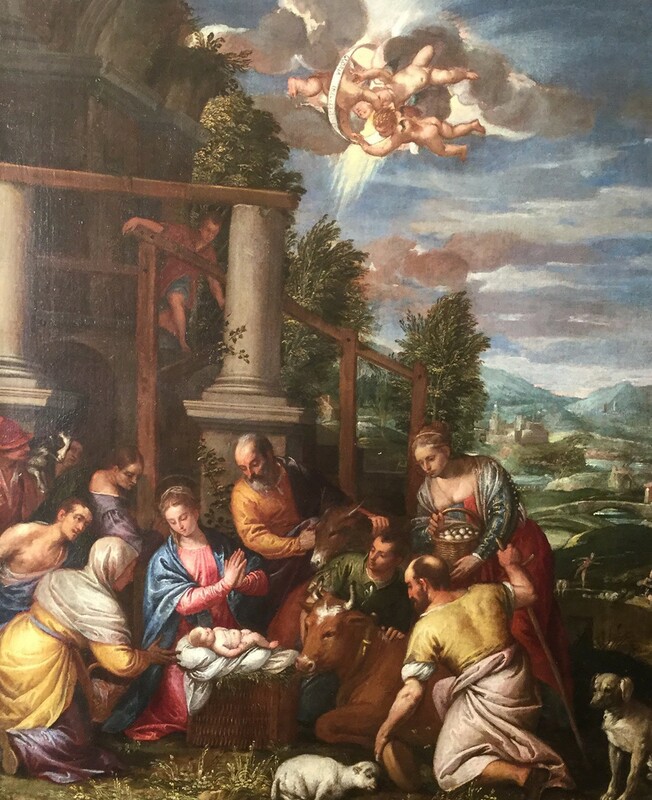 Our Nativity, like the Barbieri work, is full of telling detail such as the lovingly-rendered animals that attend the scene, the man looking down from the stairs, or the joyous, air-bound putti celebrating the birth. In the distance a finely executed landscape draws the viewer into the Veneto and the foothills of the Dolomites. It is a ravishing scene, probably dating from the last years of the artist’s career, bound together by a tightly-knit composition and a rich chromaticism that is the direct legacy Veronese and and the Bassano family. Another Nativity in S Afra, Brescia, presents a more crowded and shut-in composition, though also relishing naturalistic detail and a crisp, distant landscape. In her informative entry on Caliari in the Macmillan Dictionary of Art Diana Gisolfi comments on the specific precision and delicacy in the artist’s work, which set him apart from the gestural sweep of his father’s large-scale paintings. What Carletto lacks in grand gestures, however, he makes up for in localised charm. Signed works by Carliari can be seen in the Prado, Madrid, the Uffizi and the Pitti, Florence and the Accademia, Venice. I am writing to enquire about "The Nativity"